Scientific advances in the creation of restorative biomaterials, in vitro cell culture technology, tissue grafting, tissue engineering, molecular biology and the human genome project provide the basis for the introduction of new technologies into dentistry. Non-vital infected teeth have long been treated with root canal therapy (for mature root apex) and apexification (for immature root apex), or doomed to extraction. Although successful, current treatments fail to re-establish healthy pulp tissue in these teeth. But, what if the non-vital tooth could be made vital once again? That is the hope offered by regenerative endodontics, an emerging field focused on replacing traumatized and diseased pulp with functional pulp tissue. Restoration of vitality of non-vital tooth is based on tissue engineering and revascularization procedures. The purpose of this article is to review these biological procedures and the hurdles that must be overcome to develop regenerative endodontic procedures. Regenerative endodontic procedures can be defined as biologically based procedures designed to create and deliver tissues to replace diseased, missing and traumatized pulp-dentin complex. The science of regenerative endodontics has a long history dating back to 1952 when Dr. BW Hermann reported on the application of calcium hydroxide in a case report of vital pulp amputation. Presently, two concepts exist in regenerative endodontics to treat non-vital infected teeth - one is the active pursuit of pulp-dentine regeneration to implant or regrow pulp (tissue engineering technology), and the other in which new living tissue is expected to form from the tissue present in the teeth itself, allowing continued root development (revascularization). Stem cells - to respond to growth factors. Scaffold of extracellular matrix (ECM). Growth factors (signals for morphogenesis). Embryonic stem cells - located within the inner cell mass of the blastocyst stage of development. Postnatal stem cells - that have been isolated from various tissues including bone marrow, neural tissue, dental pulp and periodontal ligament. Autologous stem cells - are obtained from the same individual to whom they will be implanted. Allogenic stem cells - originate from a donor of the same species. Xenogenic cells - are those isolated from individuals of another species. Stem cells from various sources and their features studied by various researchers ,,,,,,,,,,,,,,,,,,,,,,,,,,, are shown in [Table 1]. Autologous stem cells are relatively easy to harvest and easy to inject by syringe (injectable postnatal stem-cell therapy). But in this technique, cells have low survival rate and they might migrate to different locations within the body possibly leading to aberrant patterns of mineralization. A solution to the above problem is to apply the cells together with scaffold material- the second component of tissue engineering. A scaffold used for regeneration should provide the framework for cell growth, differentiation and organization at a local site. A scaffold should be porous to allow for placement of cells and also be biocompatible with host tissue. It should be biodegradable and should degrade gradually so that it is replaced by regenerative tissue. It should be effective for transport of nutrients and waste. Most tissue engineering efforts use biomaterials for scaffolds already approved by the FDA. They can be natural (collagen, dentin, fibrin, silk, alginate) or synthetic (various polymers like PLA, PGA, etc.). Synthetic polymers are generally degraded by simple hydrolysis while natural polymers are mainly degraded enzymatically. Various scaffolds studied by different researchers ,,,,,,,,,,,,,, are shown in [Table 2]. The seeding of cells on tissue engineering scaffolds is known as 'creating a tissue construct'. To promote the formation of higher order tissue structures, tissue constructs are maintained in cell culture in the presence of bioactive molecules called growth factors-the third component of tissue engineering. Growth factors are proteins that bind to receptors on the cell and induce cellular proliferation and/or differentiation. Many growth factors are quite versatile, stimulating cellular division in numerous cell types, while others are more cell specific. 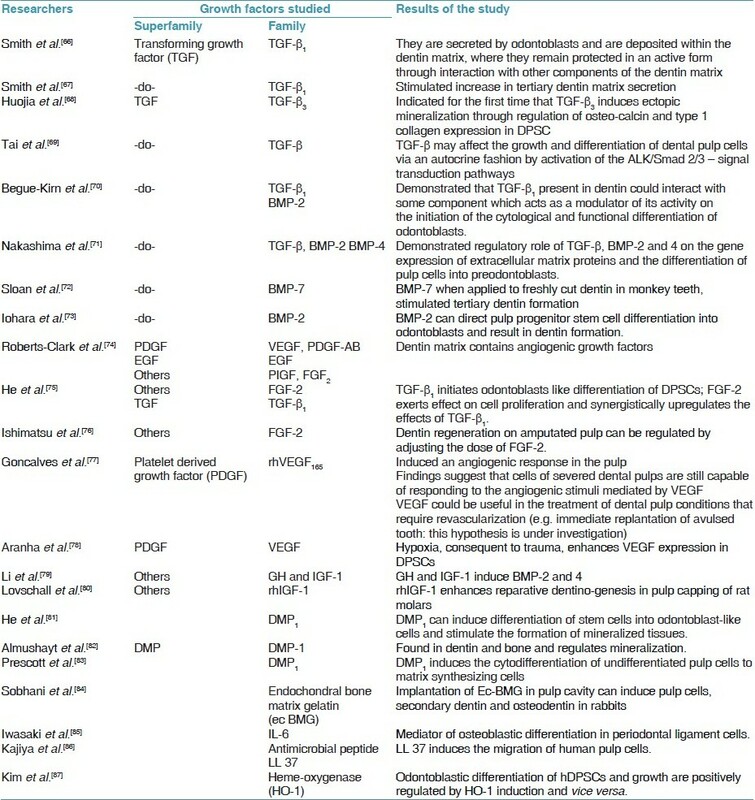 Various growth factors studied ,,,,,,,,,,,,,,,,,,,,, in regeneration of pulp-dentin complex are depicted in [Table 3]. Growth factors play a role in signalling many events in pulp-dentine regeneration. Two important families of growth factor that play a vital role are transforming growth factor (TGF) and bone morphogenetic protein (BMP). TGF-β1 and β3 are important in cellular signalling for odontoblast differentiation and stimulation of dentin matrix secretion. These growth factors are secreted by odontoblasts and are deposited within the dentin matrix, where they remain protected in an active form through interaction with other components of the dentin matrix. The addition of purified dentin protein fractions stimulates an increase in tertiary dentin matrix secretion suggesting that TGF-β1 is involved in injury signalling and tooth-healing reaction. BMPs induce higher quantity and more homogeneous reparatory dentin with the presence of many tubes with defined odontoblastic process as compared to that with calcium hydroxide. BMP-2, BMP-4 and BMP-7 have been shown to direct stem cell differentiation into odontoblasts and result in dentin formation making the BMP family the most likely candidate as growth factors. Some natural materials like dentin are also used because they release bio-active molecules. Enamel matrix derivative is also capable of inducing dentin formation when applied to dentin pulp complex. Although we are aware of the role played by these growth factors, for tissue engineering to be successful it is critical to deliver appropriate growth factors to the desired site at the appropriate dose and for appropriate time for which further research is required. Many of these proteins have short half life in the body, yet they need to be present for an extended period to be effective. For this, an alternate approach is to deliver a gene that encodes for the growth instead of delivering factor itself, called gene therapy. Genes can stimulate or induce a natural biological process by expressing a molecule involved in regenerative response for the tissue of interest. Precise delivery and efficient transfer of genes into target tissue cells, prompt assessment of gene expression at required times and appropriate levels and/or minimization of undesirable systemic toxicity are essential prerequisites for successful gene therapy. Either viral or non-viral vectors are used to enable the cellular uptake and expression of genes. Viral vectors are genetically altered to eliminate their disease-causing ability. The viruses can replicate genes of interest together with their own genome, through the use of host cell genetic machinery. Various viral vectors studied ,,,,,,, are depicted in [Table 4]. Need for establishment of isolation, identification and expansion protocol of pulp stem cells. Safe and efficient gene delivery system needs to be optimized. Researchers must learn how to accurately control gene therapy and make it very cell specific so that it is safe to use clinically. Requirements to demonstrate that gene therapy can provide cost-effective and safe long-term treatment for conditions that would otherwise lead to significant pulp necrosis. Numerous regenerative studies have demonstrated that stem cells can attach to and grow on tissue-engineered scaffolds but there are few studies on potential of stem cells to create dental pulp constructs within human cleaned and shaped root canals. Recent study has reported for the first time regeneration of dental pulp-like tissue in endodontically treated root canals of real-size, native human teeth. This newly formed tissue appeared dense with disconnected cells surrounded by extracellular matrix. Erythrocyte filled blood vessels were formed with endothelial-like cell lining. There was complete fill of dental pulp-like tissue in entire root canal from root apex to pulp chamber with tissue integration to dentinal walls. Dental pulp construct growing in root canal without functional connection is meaningless; hence, further research is required to regenerate a replacement vital pulp attached to the circulatory system and the old dentin as well as produce new dentin matrix. Regeneration of tissue from cells in teeth itself. Apex open > 1.5 mm. Matrix into which new tissue can grow. No instrumentation of the canals. Sodium hypochlorite is used as an irrigant. Formation of a blood clot probably serves as a protein scaffold permitting 3-dimensional ingrowth of tissue. All the studies report continued thickening of the dentinal walls and subsequent apical closure. The root length is increased by the growth of cementum. Connective tissue similar to periodontal ligament was also present in the canal space  . The success of root canal revascularization is mainly due to the following facts: firstly, the immature avulsed tooth has an open apex, short root and intact but necrotic pulp tissue. Therefore, the new tissue has easy access to the root canal system and a relatively short distance for proliferation to reach the coronal pulp horn. The speed with which the tissue completely revascularizes the pulp space is important because bacteria from outside are continually attempting to enter the pulp space. The ischemically necrotic pulp acts as a scaffold into which the new tissue grows, and the fact that the crown is usually intact slows bacterial penetration because their only access to the pulp is through cracks or enamel defects. Thus, the race between proliferation of new tissue and infection of the pulp space favors the new tissue. Secondly, minimum instrumentation preserves viable pulp tissue which contributes to further development of open apex root. Thirdly, young patients have greater healing capacity and more stem cell regenerative potential. The greatest benefit of these biological approaches for dental tissue restoration over many conventional dental materials is that the reparative matrices become an integral part of the tooth, overcoming any of the problems of retention of a restoration and possible marginal bacterial microleakage. This treatment approach strengthens the root walls of immature teeth. Radiographical findings of continued dentinal wall thickening do not address the cellular nature of this calcified material. In contrast source of cells regenerating the replacement pulp tissue in implanting dental pulp construct is endodontic in origin. Although these case reports primarily involve treating the immature permanent teeth, it is quite possible that knowledge gained from this clinical application will have value in developing regenerative endodontic procedures for the fully developed permanent teeth. Future regenerative endodontics may involve the cleaning and shaping of root canals followed by the implantation of vital dental pulp tissue constructs created in laboratory. The success of regenerative endodontic therapy is dependent on the ability of researchers to create a technique that will allow clinicians to create a functional pulp tissue within cleaned and shaped root canal systems. The source of pulp tissue may be from root canal revascularization, stem-cell therapy and pulp implantation. Although the replacement pulp has the potential to revitalize teeth, it may also become susceptible to further pulp disease and may require retreatment; the implantation of engineered tissue also requires enhanced microbiological control methods required for adequate tissue regeneration. The success of clinical applications of pulp stem cells is limited by the culture conditions and the nature of microenvironment in which the primitive multipotent pulp stem cells are maintained and expanded. To improve the ability of dental pulp constructs to adhere to root canal walls, it seems that the ideal scaffold design is in the same shape as gutta-percha cones. Researchers had used single-canal teeth and cylindrical scaffolds in an attempt to simplify the transplantation process. A more complex root canal anatomy will require more complex scaffolds or the use of more flexible scaffolds to perform regenerative endodontics. Dental pulp tissue constructs adhered more completely to the coronal aspects of the root canal and less completely to the middle and apical aspects. This likely was caused by the increasing complexity of root canal anatomy toward the apex and the physical constraints of the scaffold materials, as well as the placement method. Since most of the tissue-engineered parts have been developed using very potent signal molecules to induce the transformation the growth of the stem cells, a way has to be found to insure that these transformation and growth will not continue beyond control when implanted. Matching the aging of the implanted tissue-engineered parts with that of the surrounding tissues and organs is a great obstacle too. 1. Herman BW. On the reaction of the dental pulp to vital amputation and calxyl capping. Dtsch Zahnarztl Z 1952;7:1446-7. 2. Langer R, Vacanti JP. Tissue engineering. Science 1993;260:920-6. 3. Gronthos S, Brahim J, Li W, Fisher LW, Cherman N, Boyde A, et al. 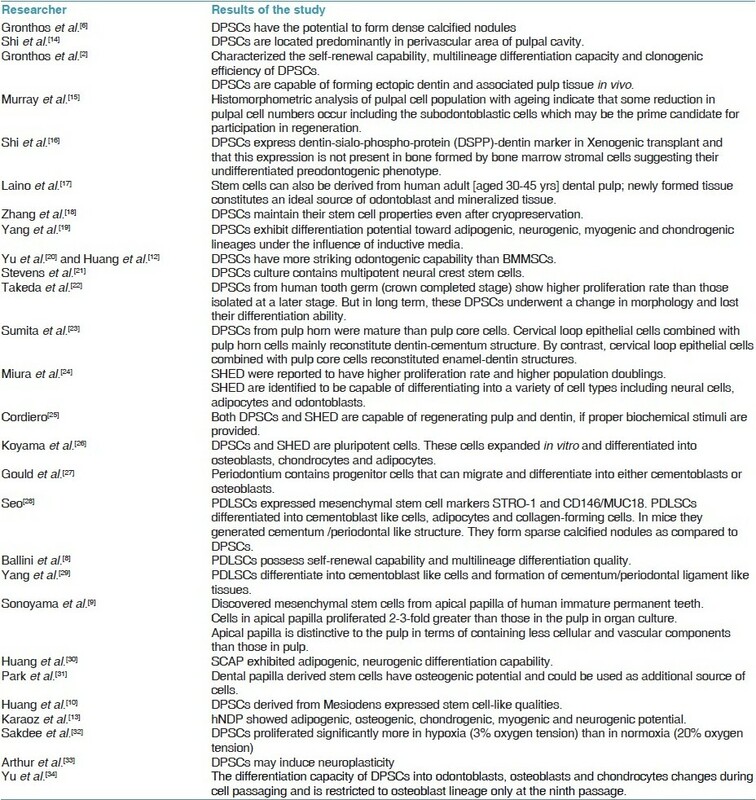 Stem cell properties of human dental pulp stem cells. J Dent Res 2002;81:531-5. 4. Fortier LA. Stem cells: classifications, controversies, and clinical applications. Vet Surg 2005;34:415-23. 5. Yu J, Wang Y, Deng Z, Tang L, Li Y, Shi J, Jin Y. Odontogenic capability: bone marrow stromal stem cells versus dental pulp stem cells. Biol Cell 2007;99:465-74. 6. Gronthos S, Mankani M, Brahim J, Robey PG, Shi S. Postnatal human dental pulp stem cells (DPSCs) in vitro and in vivo. Proc Natl Acad Sci USA 2000;97:13625-30. 7. Miura M, Gronthos S, Zhao M, Fisher LW, Robey PG, Shi S. SHED: stem cells from human exfoliated deciduous teeth. Proc Natl Acad Sci USA 2003;100:5807-12. 8. Ballini A, De Frenza G, Cantore S, Papa F, Grano M, Mastrangelo F, et al. In vitro stem cell cultures from human dental pulp and periodontal ligament: new prospects in dentistry. Int J Immunopathol Pharmacol 2007;20:9-16. 9. Sonoyama W, Liu Y, Yamaza T, Tuan RS, Wang S, Shi S, et al. Characterization of the apical papilla and its residing stem cells from human immature permanent teeth: a pilot study. J Endod 2008;34:166-71. 10. Huang AH, Chen YK, Lin LM, Shieh TY, Chan AW. Isolation and characterization of dental pulp stem cells from a supernumerary tooth. J Oral Pathol Med 2008;39:571-4. 11. Yang XC, Fan MW. Identification and isolation of human dental pulp stem cells. Zhonghua Kou Qiang Yi Xue Za Zhi 2005;40:244-7. 12. Huang GT, Gronthos S, Shi S. Mesenchymal stem cells derived from dental tissues vs those from other sources: Their biology and role in regenerative medicine. J Dent Res 2009;88:792-806. 13. Karaöz E, Doðan BN, Aksoy A, Gacar G, Akyüz S, Ayhan S, et al. Isolation and in vitro characterisation of dental pulp stem cells from natal teeth. Histochem Cell Biol 2010;133:95-112. 14. Shi S, Robey PG, Gronthos S. Comparison of human dental pulp and bone marrow stromal stem cells by cDNA microarray analysis. Bone 2001;29:532-9. 15. Murray PE, Smith AJ. Saving pulps - A biological basis. An overview. Prim Dent Care 2002;9:21-6. 16. Shi S, Bartold PM, Miura M, Seo BM, Robey PG, Gronthos S. The efficacy of mesenchymal stem cells to regenerate and repair dental structures. Orthod Craniofacial Res 2005;8:191-9. 17. Laino G, d'Aquino R, Graziano A, Lanza V, Carinci F, Naro F, et al. A new population of human adult dental pulp stem cells: an useful source of living autologous fibrous bone tissue (LAB). J Bone Miner Res 2005;20:1394-402. 18. Zhang W, Walboomers XF, Shi S, Fan M, Jansen JA. Multi-lineage differentiation potential of stem cells derived from human dental pulp after cryopreservation. Tissue Eng 2006;12:2813-23. 19. Yang X, Zhang W, van den Dolder J, Walboomers XF, Bian Z, Fan M, et al. In vitro multilineage potential of STRO-1+ rat dental pulp cells. J Tissue Eng Regen Med 2007;1:128-35. 20. Yu J, Wang Y, Deng Z, Tang L, Li Y, Shi J, et al. Odontogenic capability: bone marrow stromal stem cells versus dental pulp stem cells. Biol Cell 2007;99:465-74. 21. Stevens A, Zuliani T, Olejnik C, LeRoy H, Obriot H, Kerr-Conte J, et al. Human dental pulp stem cells differentiate into neural crest-derived melanocytes and have label-retaining and sphere-forming abilities. Stem Cells Dev 2008;17:1175-84. 22. Takeda T, Tezuka Y, Horiuchi M, Hosono K, Iida K, Hatakeyama D, et al. Characterization of dental pulp stem cells of human tooth germs. J Dent Res 2008;87:676-81. 23. Sumita Y, Tsuchiya S, Asahina I, Kagami H, Honda MJ. The location and characteristics of two populations of dental pulp cells affect tooth development. Eur J Oral Sci 2009;117:113-21. 24. Miura M, Gronthos S, Zhao M, Fisher LW, Robey PG, Shi S. SHED: stem cells from human exfoliated deciduous teeth. Proc Natl Acad Sci USA 2003;100:5807-12. 25. Cordeiro MM, Dong Z, Kaneko T, Zhang Z, Miyazawa M, Shi S, et al. Dental pulp tissue engineering with stem cells from exfoliated deciduous teeth. J Endod 2008;34:962-9. 26. Koyama N, Okubo Y, Nakao K, Bessho K. Evaluation of pluripotency in human dental pulp cells. J Oral Maxillofac Surg 2009;67:501-6. 27. Gould TR, Melcher AH, Brunette DM. Migration and division of progenitor cell populations in periodontal ligament after wounding. J Periodontal Res 1980;15:20-42. 28. Seo BM, Miura M, Gronthos S, Bartold S, Batouli S, Brahim J, et al. Investigation of multipotent postnatal stem cells from human periodontal ligament. Lancet 2004;364:149-55. 29. Yang ZH, Zhang XJ, Dang NN, Ma ZF, Xu L, Wu JJ, et al. Apical tooth germ cell-conditioned medium enhances the differentiation of periodontal ligament stem cells into cementum/periodontal ligament-like tissues. J Periodontal Res 2009;44:199-210. 30. Huang GT, Sonoyama W, Liu Y, Liu H, Wang S, Shi S. The hidden treasure in apical papilla: The potential role in pulp/dentin regeneration and bioroot engineering. J Endod 2008;34:645-51. 31. Park BW, Hah YS, Choi MJ, Ryu YM, Lee SG, Kim DR, et al. In vitro osteogenic differentiation of cultured human dental papilla-derived cells. J Oral Maxillofac Surg 2009;67:507-14. 32. Sakdee JB, White RR, Pagonis TC, Hauschka PV. Hypoxia-amplified proliferation of human dental pulp cells. J Endod 2009;35:818-23. 33. Arthur A, Shi S, Zannettino AC, Fujii N, Gronthos S, Koblar SA. Implanted adult human dental pulp stem cells induce endogenous axon guidance. Stem Cells 2009;27:2229-37. 35. Jo YY, Lee HJ, Kook SY, Choung HW, Park JY, Chung JH, et al. Isolation and characterization of postnatal stem cells from human dental tissues. Tissue Engineering 2007;13:767-73. 36. El-Backly RM, Massoud AG, El-Badry AM, Sherif RA, Marei MK. Regeneration of dentine/pulp-like tissue using a dental pulp stem cell/poly(lactic-co-glycolic) acid scaffold construct in New Zealand white rabbits. Aust Endod J 2008;34:52-67. 37. Arora V, Arora P, Munshi AK. Banking stem cells from human exfoliated deciduous teeth (SHED): saving for the future. J Clin Pediatr Dent 2009;33:289-94. 38. Nakamura S, Yamada Y, Katagiri W, Sugito T, Ito K, Ueda M. Stem cell proliferation pathways comparison between human exfoliated deciduous teeth and dental pulp stem cells by gene expression profile from promising dental pulp. J Endod 2009;35:1536-42. 39. Govindasamy V, Abdullah AN, Ronald VS, Musa S, Ab Aziz ZA, Zain RB, et al. Inherent differential propensity of dental pulp stem cells derived from human deciduous and permanent teeth. J Endod 2010;36:1504-15. 41. Brazelton TR, Blau HM. In vivo optimizing techniques for tracking transplanted stem cells. Stem cells 2005;23:1251-65. 42. Young CS, Abukawa H, Asrican R, Ravens M, Troulis MJ, Kaban LB, et al. Tissue-engineered hybrid tooth and bone. Tissue Eng 2005;11:1599-610. 43. Taylor MS, Daniels AU, Andriano KP, Heller J. Six bioabsorbable polymers: in vitro acute toxicity of accumulated degradation products. J Appl Biomater 1994;5:151-7. 44. Karande TS, Ong JL, Agarwal CM. Diffusion in musculoskeletal tissue engineering scaffolds: design issues related to porosity, permeability, architecture, and nutrient mixing. Ann Biomed Engl 2004;32:1728-43. 45. Feng Z, Yamato M, Akutsu T, Nakamura T, Okano T, Umezu M. Investigation on the mechanical properties of contracted collagen gels as a scaffold for tissue engineering. Artif Organs 2003;27:84-90. 46. Sharma B, Elisseeff JH. Engineering structurally organized cartilage and bone tissue. Annals of Biomed Eng 2004;32:148-59. 47. Zhang W, Walboomers XF, van Kuppevelt TH, Daamen WF, Bian Z, Jansen JA. The performance of human dental pulp stem cells on different three-dimensional scaffold materials. Biomater 2006;27:5658-68. 48. Huang GT, Sonoyama W, Chen J, Park SH. In vitro characterization of human dental pulp cells: various isolation methods and culturing environments. Cell Tissue Res 2006;324:225-36. 49. Gebhardt M, Murray PE, Namerow KN, Kuttler S, Garcia GF. Cell survival within pulp and periodontal constructs. J Endod 2009;35:63-6. 50. Mooney DJ, Powell C, Piana J, Rutherford B. Engineering dental pulp like tissue in vitro. Biotechnol Prog 1996;12:865-8. 51. Bohl KS, Shon J, Rutherford B, Mooney DJ. Role of synthetic extracellular matrix in development of engineered dental pulp. Biomater Sci Polymer Educ 1998;9:749-64. 52. Buurma B, Gu K, Rutherford RB. Transplantation of human pulpal and gingival fibroblasts attached to synthetic scaffolds. Eur J Oral Sci 1999;107:282-9. 53. Chen FM, Zhao YM, Zhang R, Jin T, Sun HH, Wu ZF, et al. Periodontal regeneration using novel glycidyl methacrylated dextran (Dex-GMA)/gelatin scaffolds containing microspheres loaded with bone morphogenetic proteins. J Control Release 2007;121:81-90. 54. Xu WP, Zhang W, Asrican R, Kim HJ, Kaplan DL, Yelick PC. Accurately shaped tooth bud cell-derived mineralized tissue formation on silk scaffolds. Tissue Eng Part A 2008;14:549-57. 55. Etienne O, Schneider A, Kluge JA, Bellemin-Laponnaz C, Polidori C, Leisk GG, et al. Soft tissue augmentation using silk gels: an in vitro and in vivo study. J Periodontol 2009;80:1852-8. 56. Guo W, He Y, Zhang X, Lu W, Wang C, Yu H, et al. The use of dentin matrix scaffold and dental follicle cells for dentin regeneration. Biomater 2009;30:6708-23. 57. Inuyama Y, Kitamura C, Nishihara T, Morotomi T, Nagayoshi M, Tabata Y, et al. 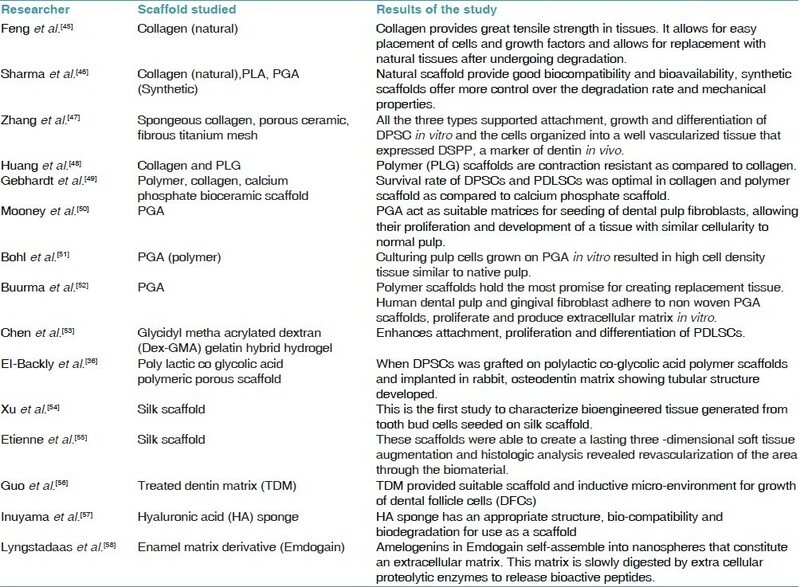 Effects of hyaluronic acid sponge as a scaffold on odontoblastic cell line and amputated dental pulp. J Biomed Mater Res B Appl Biomater 2010;92:120-8. 58. Lyngstadaas SP, Wohlfahrt JC, Brookes SJ, Paine ML, Snead ML, Reseland JE. Enamel matrix proteins: old molecules for new applications. Orthod Craniofac Res 2009;12:243-53. 59. Trojani C, Weiss P, Michiels JF, Vinatier C, Guicheux J, Daculsi G, et al. Three-dimensional culture and differentiation of human osteogenic cells in an injectable hydroxypropylmethylcellulose hydrogel. Biomater 2005;26:5509-17. 60. Luo Y, Shoichet MS. A photolabile hydrogel for guided three-dimensional cell growth and migration. Nat Mater 2004;3:249-53. 61. Weiss P, Vinatier C, Sohier J, Fatimi A, Layrolle P, Demais V, et al. Self-hardening hydrogel for bone tissue engineering. Macromolecular Symposia 2008;266:30-5. 62. Matsuno T, Hashimoto Y, Adachi S, Omata K, Yoshitaka Y, Ozeki Y, et al. Preparation of injectable 3D-formed beta-tricalcium phosphate bead/alginate composite for bone tissue engineering. Dent Mater J 2008;27:827-34. 63. Guo W, He Y, Zhang X, Lu W, Wang C, Yu H, et al. The use of dentin matrix scaffold and dental follicle cells for dentin regeneration. Biomaterials 2009;30:6708-23. 64. Wingard JR, Demetri GD. Clinical applications of cytokines and growth factors. New York: Springer; 1999. 65. Bazley LA, Gullick WJ. The epidermal growth factor receptor family. Endocr Relat Cancer 2005;12:17-27. 66. Smith AJ, Matthews JB, Hall RC. Transforming growth factor-beta 1 in dentin matrix. Ligand activation and receptor expression. Eur J Oral Sci 1998;106:179-84. 67. Smith AJ, Murray PE, Sloan AJ, Matthews JB, Zhao S. Trans-dentinal stimulation of tertiary dentinogenesis. Adv Dent Res 2001;15:51-4. 68. Huojia M, Muraoka N, Yoshizaki K, Fukumoto S, Nakashima M, Akamine A, et al. TGF-beta 3 induces ectopic mineralization in fetal mouse dental pulp during tooth germ development. Dev Growth Differ 2005;47:141-52. 69. Tai T, Chan C, Lin C, Chen L, Jeng J, Chang M. Transforming growth factor â2 regulates growth and differentiation of pulp cells via ALK5/Smad2/3. J Endod 2008;34:427-32. 70. Begue-Kirn C, Smith AJ, Ruch JV, Wozney JM, Purchio A, Hartmann D, et al. In vitro effects of dentin proteins, transforming growth factor beta 1 and bone morphogenetic protein 2 on the differentiation of odontoblasts. Int J Dev Biol 1992;36:491-503. 71. Nakashima M, Nagasawa H, Yamada Y, Reddi AH. Regulatory role of transforming growth factor-beta, bone morphogenetic protein-2, and protein-4 on gene expression of extracellular matrix proteins and differentiation of dental pulp cells. Dev Biol 1994;162:18-28. 72. Sloan A, Rutherford RB, Smith AJ. In vitro Stimulation of the rat dentin-pulp complex by bone morphogenetic protein-7. Arch Oral Biol 2000;45:173-7. 73. Iohara K, Nakashima M, Ito M, Ishikawa M, Nakasima A, Akamine A. Dentin regeneration by dental pulp stem cell therapy with recombinant human bone morphogenetic protein 2. J Dent Res 2004;83:590-5. 74. Roberts-Clark DJ, Smith AJ. Angiogenic growth factors in human dentin matrix. Arch Oral Biol 2000;45:1013-6. 75. He H, Yu J, Liu Y, Lu S, Liu H, Shi J, et al. In vitro effects of FGF2 and TGFbeta (1) on the differentiation of human dental pulp stem cells. Cell Biol Int 2008;32:827-34. 76. Ishimatsu H, Kitamura C, Morotomi T, Tabata Y, Nishihara T, Chen KK, et al. Formation of dentinal bridge on surface of regenerated dental pulp in dentin defects by controlled release of fibroblast growth factor-2 from gelatin hydrogels. J Endod 2009;35:858-65. 77. Gonçalves S, Dong Z, Bramante C, Holland G, Smith A, Nör J. Tooth slice-based models for the study of human dental pulp angiogenesis. J Endod 2007;33:811-4. 78. Aranha AM, Zhang Z, Neiva KG, Costa CA, Hebling J, Nör JE. Hypoxia enhances the angiogenic potential of human dental pulp cells. J Endod 2010;36:1633-7. 79. Li H, Bartold PM, Zhang CZ, Clarkson RW, Young WG, Waters MJ. Growth hormone and insulin-like growth factor I induce bone morphogenetic proteins 2 and 4: A mediator role in bone and tooth formation? Endocrinology 1998;139:3855-62. 80. Lovschall H, Fejerskov O, Flyvbjerg A. Pulp-capping with recombinant human insulin- like growth factor I (rhIGF-I) in rat molars. Adv Dent Res 2001;15:108-12. 81. He J, Dahl T, Veis A, George A. Dentin matrix protein 1 initiates hydroxyapatite formation in-vitro. Connect Tissue Res 2003;44:240-5. 82. Almushayt A, Narayanan K, Zaki A, George A. dentin matrix protein 1 induces cytodifferentiation of dental pulp stem cells into odontoblasts. Gene Ther 2006;13:611-20. 83. Prescott RS, Alsanea R, Fayad MI, Johnson BR, Wenckus CS, Hao J, et al. In vivo generation of dental pulp-like tissue by using dental pulp stem cells, a collagen scaffold, and dentine matrix protein 1 after subcutaneous transplantation in mice. J Endod 2008;34:421-6. 84. Sobhani A, Kazemi AS, Niknafs B, Kazemi S, Fathi F. A study on histologic structure and mineral components of secondary dentin formed by endochondral bone matrix gelatin (ec bmg) implantation in rabbit. J Dent Tehran Uni Med Sci 2002;15:3. 85. Iwasaki K, Komaki M, Mimori K, Leon E, Izumi Y, Ishikawa I. IL-6 induces osteoblastic differentiation of periodontal ligament cells. J Dent Res 2008;87:937-42. 86. Kajiya M, Shiba H, Komatsuzawa H, Ouhara K, Fujita T, Takeda K, et al. The antimicrobial peptide LL37 induces the migration of human pulp cells: a possible adjunct for regenerative endodontics. J Endod. 2010 Jun;36:1009-13. 87. Kim SJ, Min KS, Ryu HW, Lee HJ, Kim EC. The role of heme oxygenase-1 in the proliferation and odontoblastic differentiation of human dental pulp cells. J Endod 2010;36:1326-31. 88. Nor JE, Christensen J, Mooney DJ, Poleverini PJ. Vascular endothelial growth factor (VEGF)-mediated angiogenesis is associated with enhanced endothelial cell survival and induction of Bcl-2 expression. Am J Pathol 1999;154:375-84. 89. Sheridan ME, Shea LD, Peters MC, Mooney DJ. Bioabsorbable polymer scaffolds for tissue engineering capable of sustained growth factor delivery. J Control Release 2000;64:91-102. 90. Moioli EK, Clark PA, Chen M, Dennis JE, Erickson HP, Gerson SL, et al. Synergistic actions of hematopoietic and mesenchymal stem/progenitor cells in vascularizing bioengineered tissues. PLoS One 2008;3:3922. 91. Bonadio J, Smiley E, Patil P, Goldstein S. In vivo localized, direct plasmid gene delivery: prolonged therapy results in reproducible tissue regeneration. Nat Med 1999;5:753-9. 92. Naldini L, Blomer U, Gallay P, Ory D, Mulligan R, Gage FH, et al. In vivo gene delivery and stable transduction of nondividing cells by a lentiviral vector. Science 1996;272:263-7. 93. Rutherford, R Bruce. BMP-7 gene transfer to inflamed ferret dental pulps. Eur J Oral Sci 2001;109:422-4. 94. Sugiyama O, An DS, Kung SP, Feeley BT, Gamradt S, Liu NQ, et al. In vivo Lentivirus-mediated gene transfer induces long-term transgene expression of BMP-2 in vitro and new bone formation. Mol Ther 2005;11:390-8. 95. Yang X, van der Kraan PM, van den Dolder J, Walboomers XF, Bian Z, Fan M, et al. STRO-1 selected rat dental pulp stem cells transfected with adenoviral-mediated human bone morphogenetic protein 2 gene show enhanced odontogenic differentiation. Tissue Eng 2007;13:2803-12. 96. Zhang Y, Song J, Shi B, Wang Y, Chen X, Huang C, et al. Combination of scaffold and adenovirus vectors expressing bone morphogenetic protein-7 for alveolar bone regeneration at dental implant defects. Biomater 2007;28:4635-42. 97. Shang SH, Zhang YF, Shi B, Cheng XR. Construction and identification of recombinant human platelet-derived growth factor-B adenoviral vector and transfection into periodontal ligament stem cells. Zhonghua Kou Qiang Yi Xue Za Zhi 2008;43:584-8. 98. Scheller EL, Chang J, Wang CY. Wnt/â-catenin inhibits dental pulp stem cell differentiation. J Dent Res 2008;87:126-30. 99. Zhang Y, Shi B, Li C, Wang Y, Chen Y, Zhang W, et al. The synergetic bone-forming effects of combinations of growth factors expressed by adenovirus vectors on chitosan/collagen scaffolds. J Control Release 2009;136:172-8. 100. Nakashima M. Tissue engineering in endodontics. Aust Endod J 2005;31:111-3. 101. Jullig M, Zhang WV, Stott NS. Gene therapy in orthopedic surgery: the current status. ANZ J Surg 2004;74:46-54. 102. Stolberg SG. Trials are halted on gene therapy: child in experiment falls ill: new setback for research. NY Times 2002: A1, A25. 103. Gotlieb EL, Murray PE, Namerow KN, Kuttler S, Garcia-Godoy F. An ultrastructural investigation of tissue-engineered pulp constructs implanted within endodontically treated teeth. J Am Dent Assoc 2008;139:457-65. 104. Kim JY, Xin X, Moioli EK, Chung J, Lee CH, Chen M, et al. Regeneration of dental-pulp-like tissue by chemotaxis-induced cell homing. Tissue Eng Part A 2010;16:3023-31. 105. Nygaard-Ostby B, Hjortdal O. Tissue formation in the root canal following pulp removal. Scand J Dent Res 1971;79:333-48. 106. Banchs F, Trope M. Revascularization of immature permanent teeth with apical periodontitis: New treatment protocol? J Endod 2004;30:196-200. 107. Iwaya S, Ikawa M, Kubota M. Revascularization of an immature permanent tooth with apical periodontitis and sinus tract. Dent Traumatol 2001;17:185-7. 108. Chueh LH, Huang GT. Immature teeth with periradicular peridontitis or abscess undergoing apexogenesis: a paradigm shift. J Endod 2006;32:1205. 109. Shah N, Logani A, Bhaskar U, Aggarwal V. Efficacy of revascularization to induce apexification/apexogenesis in infected, non-vital, immature teeth: a pilot clinical study. J Endod 2008;34:919-25. 110. Petrino JA, Boda KK, Shambarger S, Bowles WR, McClanahan SB. Challenges in regenerative endodontics: a case series. J Endod 2010;36:536-41. 111. Wang X, Thibodeau B, Trope M, Lin LM, Huang GT. Histologic characterization of regenerated tissues in canal space after the revitalization/revascularization procedure of immature dog teeth with apical periodontitis. J Endod 2010;36:56-63.
brizuela c., c. and galleguillos g., s. and carrión a., f. and cabrera p., c. and luz c., p. and inostroza s., c.
Mao, J.J. and Kim, S.G. and Zhou, J. and Ye, L. and Cho, S. and Suzuki, T. and Fu, S.Y. and Yang, R. and Zhou, X.
Marawar, P.P. and Mani, A. and Sachdev, S. and Sodhi, N.K. and Anju, A.
Samant, P.S. and Tewari, T. and Gua, K.K.